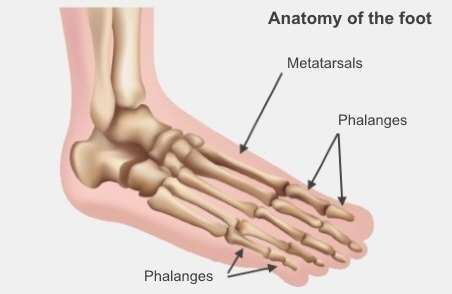 Your toes are made up of three bones called phalanges, apart from your big toe, which has two bones. Your toe bones can break (fracture) if something heavy drops on them, or if you stub them against a hard object. You might not need an X-ray if your toe is broken, unless it is bent at an angle. Your doctor will talk with you about this after examining your foot. We treat most broken toes by strapping them to the next toe, with some gauze in between. It will usually feel much better after a week or so, but can take around four to six weeks for it to heal. While your toe is healing, avoid any sports that might re-injure it. Take regular painkillers, such as paracetamol. Wear comfortable shoes that have lots of room for your toe but are firm enough to protect it. If your toe is broken at an angle, your doctor may need to move the bone back into place. You will probably need a local anaesthetic injection to numb your toe while the doctor pulls the bone into the right position. You may get a lot of bruising under your toenail. If it is putting pressure on your toenail, your doctor may make a small hole in your nail to remove some of the blood that's causing the bruising and release the pressure. If the break is very bad or involves the joint between two bones, you may need surgery to move the bones into a better position. You probably won't need a follow-up appointment for a minor break. However, you should see a doctor again if the pain gets worse or if your toe becomes hot, red and swollen, or discoloured. Written by HealthInfo clinical advisers. Endorsed by podiatry liaison, Canterbury DHB. Page created March 2016.